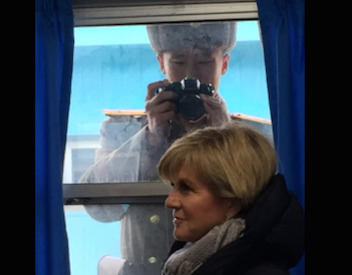 Foreign Minister Julie Bishop gets tough with North Korea (image via @JulieBishopMP). SO NOW we are supposed to be afraid of the Koreans hitting us with nuclear weapons. Such an attack on Australian soil is highly unlikely for a number of reasons, but more of that later. What is interesting is the Turnbull Government's alacrity in seizing yet another opportunity to divert attention from its dismal performance. This tactic is as old as the human race itself: create an external threat to keep the populace under control. American politicians are no less adept at creating fear and Lyndon B. Johnson is the clear gold medal winner in the field. He was responsible for the most controversial political advertisement ever made — Donald Trump notwithstanding. The ad came out during the 1964 presidential campaign, when Johnson was running against the hawkish Barry Goldwater. This was the "Daisy" television commercial, which opened with a pretty little girl standing in a meadow complete with chirping birds. She is picking the petals off a daisy and counting each one. At "nine", a scary male voice starts counting down a missile launch. The little girl looks at the sky while the camera zooms in on her pupil, eventually blacking out the entire screen. At “zero”, there is a flash and a mushroom cloud. Many attributed Goldwater's loss to this one hard-hitting TV commercial. And then, of course, there is 9/11. Zbigniew Brzezinski, national security advisor to former Democrat president Jimmy Carter, wrote a piece entitled 'Terrorised by War on Terror'. The culture of fear is like a genie that has been let out of its bottle. It acquires a life of its own — and can become demoralising. America today is not the self-confident and determined nation that responded to Pearl Harbor; nor is it the America that heard from its leader, at another moment of crisis, the powerful words "The only thing we have to fear is fear itself"; nor is it the calm America that waged the Cold War with quiet persistence despite the knowledge that a real war could be initiated abruptly within minutes and prompt the death of 100 million Americans within just a few hours. We are now divided, uncertain and potentially very susceptible to panic in the event of another terrorist act in the United States itself. That is the result of five years of almost continuous national brainwashing on the subject of terror [since 9/11]. Rather than buying the Government's fear campaign, it is best to have a rational look at the facts. The North Korean nuclear arsenal is composed of a strategic stock of from ten to 16 nuclear weapons. They are roughly comparable in yield to the 15 kiloton Hiroshima bomb. The North Koreans are still working to reduce their physical size and perfect re-entry technology. At one stage in my misspent youth, I financed my UCLA graduate degree by working as an engineer in the U.S. aerospace industry. My job at Aerojet-General involved developing terminal guidance systems for intercontinental ballistic missiles(ICBMs). I became experienced in matching our system to real targets. As I examined air photos of Russian cities, I started to realise that I was in the business of killing people. Developing the system was challenging and fun. This was different. I went to my bosses and said I was concerned about the end use of our system. They were nice American family men, with wives, kids, mortgages, cats and dogs. This was the mutually assured destruction (MAD) theory. I quit. But I did learn about targeting. You don't waste your weapons on unimportant targets unless you have a whole bunch of them, like the U.S. and Russia. The North Koreans, with their severely limited number of weapons, would be picking their targets with great care. Blowing up Cairns and a bit of what is left of the Great Barrier Reef would not be high on their targeting list. North Korea does have some missile capacity, in spite of many setbacks. An attempt to fire a missile from a submarine, on Sunday, was a flop, with the missile covering only 30 kilometres before splashing into the sea. Most of their missiles are relatively short range ones, like the Rodong, which has a range of 1,000 to 1,500 kilometres with an explosive warhead. North Korea is known to have approximately 300 Rodongs. But why mess around with missile delivery systems? We, in the West, are fixated on high-tech solutions to simple problems. When you have a large piece of equipment to move somewhere, you go by sea. If North Korea wanted to nuke the West Coast of the U.S., all they have to do is put a bomb in the hold of a vessel. The crew can be toasting the health of Kim Jong-un with soju while they pull the pin on the bomb they are using for a table. The North Koreans have utilised ships in the past for covert missions. There was the "Pong Su incident" off the Australian coast in 2003. The Pong Su was caught smuggling 125 kilograms of heroin (worth $160 million). The ship had been modified for long voyages and carried enough fuel and provisions to travel around the world without entering a port. An official of the governing Workers Party of Korea was found on board, linking the operation to Kim Jong-il's regime. The freighter was later towed out to sea and used for target practice by an F-111 dropping laser-guided bombs. North Korean missiles (or fishing boats) are not going to wipe out Australia. We are just too unimportant as a target. Back in your box, Julie Bishop! If people really want to worry about something, there are plenty of issues to choose from: accelerating species loss, oceanic acidity, coral bleaching, Donald Trump, global warming, Adani and Japanese whaling, to name a few. North Korean missiles? Chill! #DonaldTrump and the Nuclear Keys https://t.co/3sCXKpag69 Where's the 2016 Daisy commercial?